Sorry you couldn’t find it during the drought of 2012. This is the spot you were looking for. 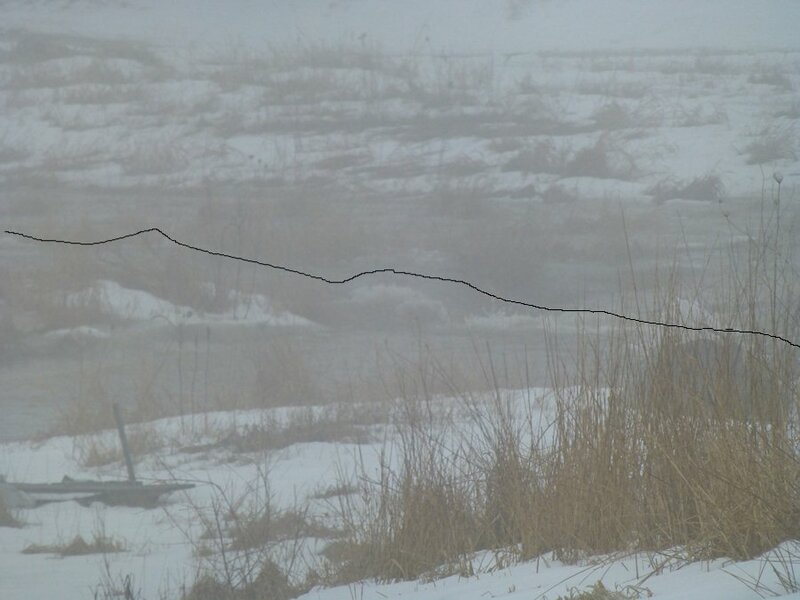 It was easy to find (midst the heavy fog) on Sunday! Normally, just a bit of a trickle but this weekend we had rain with fast melting snow and we had quite a bubbling brook! The dog wouldn’t even go through it, she jumped it! 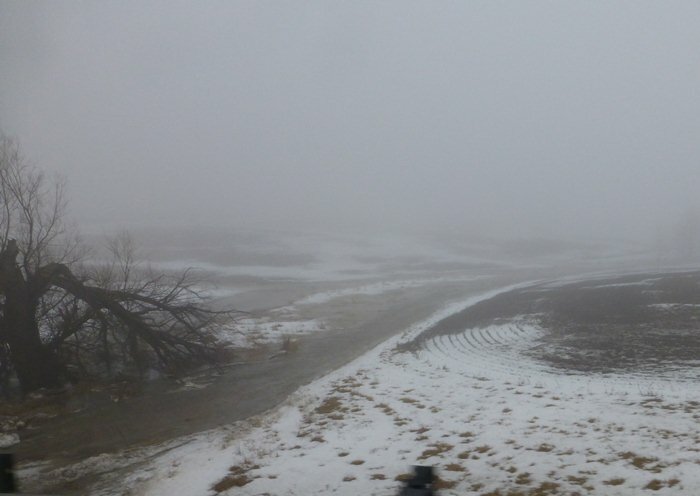 The line in the first photo shows where the creek is. 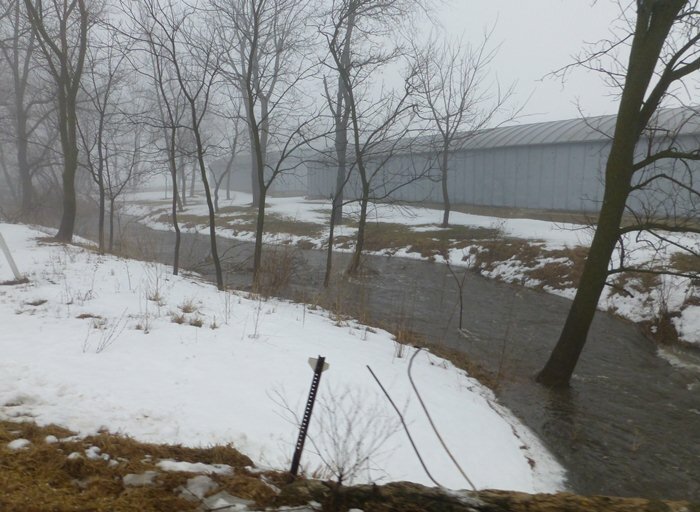 The waterway to the east of the house only has water during major flooding times, otherwise it is grass. But at this point the grass holds better than having the water rush through crop ground or if planted, the crops! Sorry the photos are hard to see — we lived in this fog all day! This year’s Dessert Auction had the theme, “Get Your Game On!”, so we were to wear our favorite team jerseys, etc. 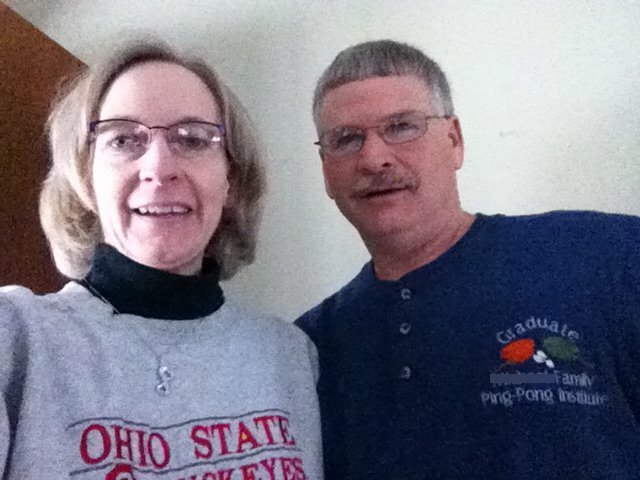 Since we are the non-sports household, we picked our brains a bit. During the weekday evenings, we searched various places for our high school coats & shirts. Mostly, we did a huge amount of donating to Goodwill and decluttering! We did find Phil’s football jersey and letter coat… however let’s just leave it at the armies didn’t fit in the sleevies anymore. I quickly downloaded the ping-pong image and embroidered a shirt for him. I have a stash of OSU shirts so that wasn’t too hard for me, even tho I was frustrated with myself that I couldn’t find my Arrows shirt. 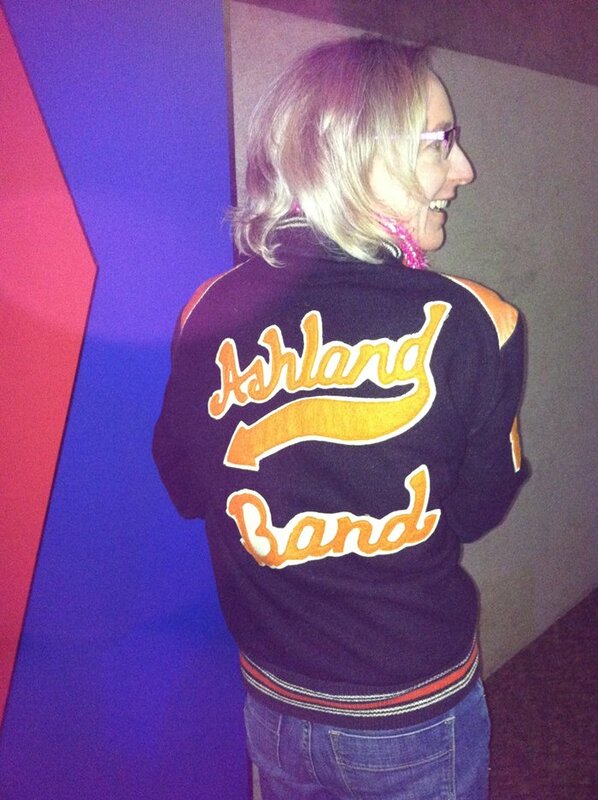 But we did find my Ashland band coat and I wore that. We thought it was fun but seriously no one really noticed what we were wearing! LOL! 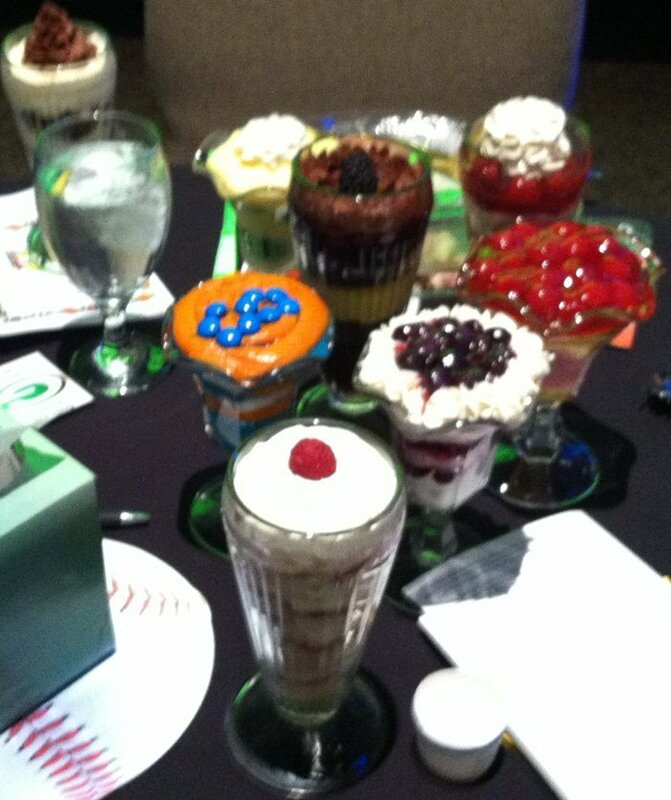 Dinner begins with the dessert auction and there were 25 large desserts that many talented hands had donated! 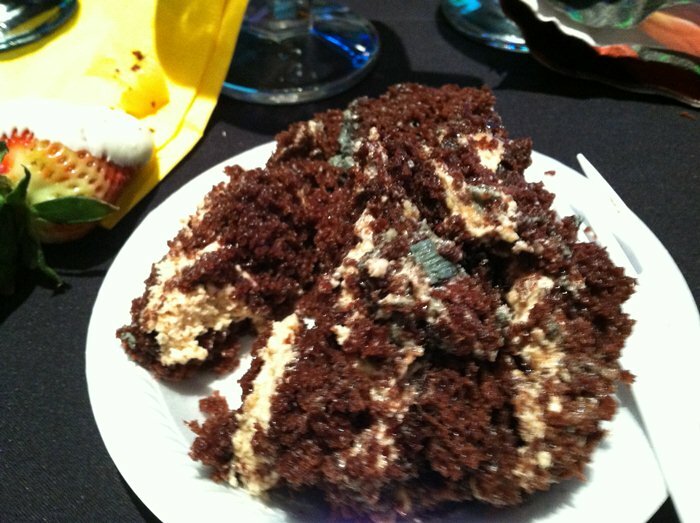 The first bid gets choice of any of the desserts and sold for $1500 this year. Another dessert later fetched that but most are in the $300 – $600 range. Our table pooled our donations together and then we had one that picks up the rest of the tab and enjoys the bidding process. 🙂 Here are the NFL Parfaits we bought using the team colors of various teams. 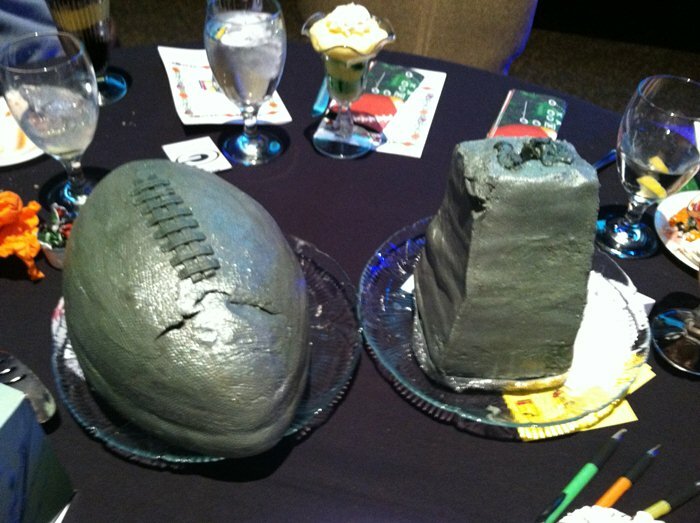 I was REALLY sure I wasn’t eating a Packer cake but “he who bids” won this for the table. The football (normal size!!) had to be removed from the base of the Award to move it to our table. Oh.my.word. The moistest chocolate cake with fluffy and not too sugary with a touch of peanut butter for the middle layers. Wow! So for these 3 at our table, we spent about $1100. The clean-up man didn’t think that was enough as I am pretty sure last year’s bids for our table went a bit more. I think he wanted to go back and bid on something else. Next our dinner of Prime Rib was served but every one tries to save room for dessert! !